Spain’s rich history means you can explore caves with Paleolithic paintings, Roman ruins and medieval Moorish mosques and fortresses. In Cadiz, in southern Spain, you can see ruins left by the Phoenicians, who founded the city 3,100 years ago. 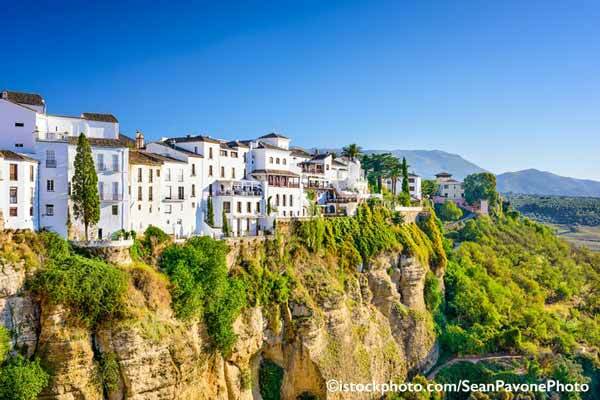 Andalucia’s Pueblos Blancos (white towns) are a must-visit. I’m a foodie and Spain’s fabulous—and fabulously varied—cuisine is a big hit with me. Succulent roast pig and lamb are specialties in some parts of Spain; the seafood is fresh and varied; and the homegrown vegetables are extraordinary. Then there’s the wine, the olive oil and all the many accoutrements of the Mediterranean diet. The Spanish love their food and they punctuate the day with meals. From café con leche—strong coffee with milk—at breakfast, you’re never long without sustenance. Take a mid-morning break, for instance, with a pincho (a snack-sized piece) of tortilla espanola, the traditional egg-and-potato omelette. It fills the gap until lunch, which isn’t until 2 p.m. or 3 p.m. Lunch itself is at least two courses: a first course that’s often a salad, soup or a vegie plate, followed by a main course of a meat or vegetarian option. Bread and a drink (often beer or wine), followed by dessert or fruit and then a coffee, complete the meal. Meeting friends later? You’ll probably enjoy a drink and tapas with them and you may end the day with a light dinner (served at 9 p.m. or later). 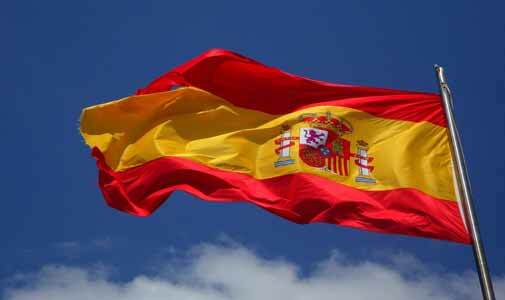 Every region of Spain has its specialties, some are world-renowned for the quality of their food. From personal experience, I’m convinced it’s impossible to have a bad meal in Galicia, the Spanish province above Portugal. Even the most unassuming little restaurant produces spectacular dishes. And the local white wines—the Albarinos and Ribeiros—pair perfectly with the region’s seafood. The same is true in the Basque Country and in much of Cataluna. And you’ve never really tasted paella, Spain’s famous rice dish, until you’ve had it in Valencia. (Some say that Valencia’s water is what makes it so special. Valencianos even grow a particular type of rice—called bomba—especially for paella). But I’ve had fabulous food all over Spain, so feel free to explore and experiment. When it comes to European destinations, Spain offers some of the best value around. Short-term rentals in some beach cities start at $900 a month, stay for longer and the price will drop considerably. 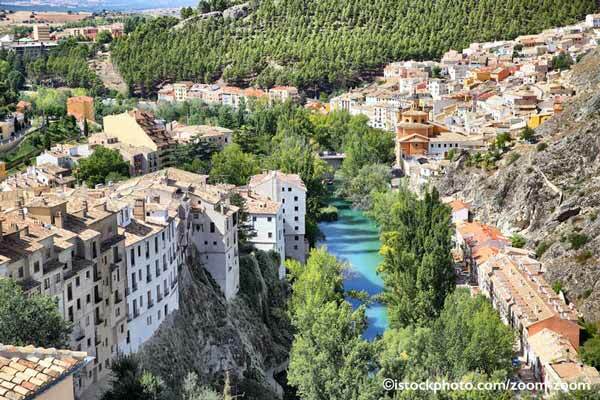 Or head to Cuenca, in central Spain, a two-hour drive southeast of Madrid. The city lies in a dry, wild region of deep gorges and pine forests and long-term, furnished rentals here can be secured for under $400 a month. Cuenca, a UNESCO World Heritage Site, in Spain’s Castilla-La Mancha region. In the port city of Valencia, on Spain’s southeastern coast, a monthly budget of around $2,500 will see you living well. That includes rent of a chic, centrally located apartment, embracing the arts, strolling the beaches, eating out often (and well) and being perfectly placed to explore the rest of Europe, too. Because dining out is such an integral part of life in Spain, it’s refreshingly affordable. For the best value, choose the lunchtime menu del dia (the menu of the day) which includes three courses and a drink and typically costs between $14 and $25. A local beer and complimentary tapa (anything from a small dish of olives to a couple of rings of fried squid) costs around $3. Fresh, in-season fruit and vegies will run you about $1.50 a kilo and, in coastal regions, fish and shellfish are $1.50 to $4.50 a kilo, depending on the variety. Your weekly grocery bill shouldn’t top more than $65. You’ll find most Spanish cities and villages are designed for walking, with most shopping easily accessible on foot. For longer distances, excellent bus and train services get you quickly from A to B. And, if you’re 60 plus, you qualify for retiree fares, which cut long-distance travel costs substantially. For my money, a country is no fun if you don’t like the people. Fortunately, that’s not a problem in Spain. You’ll find it easy to strike up conversations with Spaniards in parks, bars and cafes, especially if you speak some Spanish. (Outside the big cities, in smaller villages, you may find relatively few English speakers). Don’t be offended, though, if new friends don’t invite you back to their house right away. Though gregarious, Spaniards can also be very private—even protective—of their home space. Once you’re invited in, though, you may find that you’ve become practically part of the family. Not all of Spain is sunny all the time. The northwest gets lots of rain and the clouds that go with it. And while the weather along the coast can be mild, Spain’s interior has a typical continental climate, with hot summers and cold winters. Still, no matter what time of year, you can find someplace in Spain with agreeable weather. And with Spain’s high-speed train system, the many regional airports hosting low-cost airlines and a wide bus network, it’s easy, fast and relatively inexpensive to get around the country.